Makita, a pioneer in brushless motor technology and battery innovation, combines both in the 18V X2 LXT® (36V) Lithium-Ion Brushless Cordless ½” Right Angle Drill. It's powered by two 18V LXT® Lithium-Ion batteries for maximum performance, and has an electronically-controlled BL™ Brushless motor that matches torque and RPM to the changing demands of the application. Makita 18V X2 means freedom from the cord, and the XAD03 will take on the most demanding applications like drilling up to 6-1/4” holes with hole saws and 4-5/8” holes with self-feed bits. 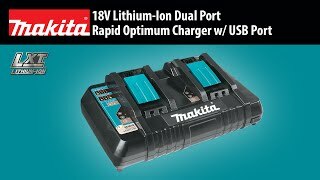 Best of all, users can remain in one battery platform, using the same fast-charging 18V batteries with the XAD03 as they use across the expansive Makita 18V LXT® cordless system. The XAD03 has a long list of features for drilling with superior speed and efficiency. The Makita BL™ Brushless Motor combined with X2 LXT® technology delivers no-load drilling speeds of 0-350 RPM and 0-1,400 RPM. Under load, the Automatic Speed Change™ technology adjusts drill speed and torque during drilling for optimum performance. Added features include an electric brake for maximum productivity, and a built-in clutch that reduces gear damage by disengaging gears if the bit binds (low speed only). It’s powered by two 18V LXT batteries for maximum power, speed and run time without the hassles of a cord. When using two 18V 5.0Ah batteries and a self-feed bit (bit sold separately), the XAD03 will deliver up to 160 2-9/16" holes per charge in 2x SPF. Capacity (wood, w/ hole saw) : 6-1/4"
Capacity (wood, w/ ship auger bit) : 2"
Capacity (wood, w/ self feed bit) : 4-5/8"
Net Weight (with battery) : 14 lbs. Shipping Weight : 29 lbs.